Time seems to be on fast forward at the moment and I would like to know where exactly this year has gone. It doesn’t seems five minutes since March. Kind of hard to believe that we’ve been across in Edinburgh for almost 9(!) months. How did that happen? On the bright side, I’m pretty much all sorted now for the festive season, which is good. Unfortunately due to lack of suitable hiding places (by which I mean J has commandeered them all) I’ve had to wrap everything already and it is now stuck on the sofa in the spare room. Ah well, one less job. J and I also decided to be Christmassy extremely early this year, and for the first time ever (that both of us can remember) put the tree up on December 1st. I still need to find chocolate tree decorations though. Anyway, onto knitting news. 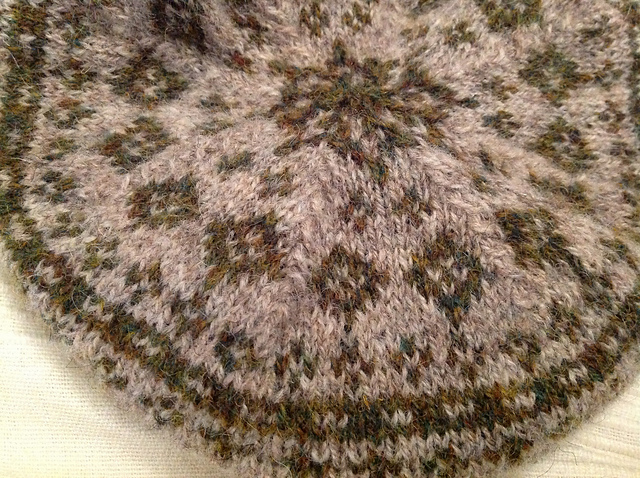 I have been knitting – I just haven’t posted much about it. I’ll post a round up of recent projects soon (I think) and I have another test knit coming up… and here is a little teaser for it. Tags: Christmas, Fair-Isle, shetland | Permalink.